What a wonde rful week! I actually got my mom's present wrapped and in the mail ON TIME this year (I think that's going on 3 years in a row, just proof that old dogs can learn new tricks!) and we had a great conversation on Mother's Day before she put her gloves on and went outside to spend the day filling her flower beds. Best part of the conversation was sharing my little 'keep your nails clean' tip! I 'rake' my nails through a bar of soap before I put gloves on, then when you wash up after gardening, the soap magically lathers up and your fingernails look great! I'm sure I got this tip from a magazine years ago, and I know it was WAY before Martha, but it's still a cool thing to know something that your mom doesn't!! Found this snapshot of my parents (vintage 1960.) I remember unzipping the bag in the back of the closet and looking at my mom's dress when I was 8 or 9 years old (which would have been when my waist was about the same as that dress) and I loved the lace and the tuille. We cut her circle skirts short for me and made bolero vests from the trimmed fabric- my fascination with poodle skirts fueled my 3rd grade wardrobe! I was taller, and bigger 'round, by my 12th birthday. My 'mini-mom' never had to deal with a teenager that borrowed her clothes and shoes! But she still had a teenage daughter, and we both survived - so she's definitely earned all the merit badges offered! BELLA Main Street Market was an incredibly fun place to be on Friday and Saturday, lots of young men on their own shopping with thoughtfulness and confidence, and many fathers with small children. There really isn't anywhere I'd rather be before the holiday than in the thick of it at BELLA with all that excitement and all those happy kids! The highlight of my day was during deliveries Saturday evening. I took a handpainted Polish Pottery teapot to Mardelle (I live in a town with both a Mardelle and a Zona, and they are two of my favorite women!) The view from Mardelle's is stunning and she invited me in while she unwrapped the gift from her daughter and we visited for a while. Mardelle loves her cup of tea and her daughter had chosen something will allow them to share that moment every day - beautifully! We chatted about her family, polka dots, bicycles and chocolate -all the things that make life 'bella'. It was such a treat and so relaxing and sweet to be able to stop - Baker City style- and just spend some time with her. I'm miles away from my own mother (but she knows I love her) and years past my own 'Grannies' Iris and Leone but for a portion of the hour last Saturday evening, I listened to Mardelle speak with love and pride about her kids. It was a perfect close of a wonderful Mothers Day Eve. 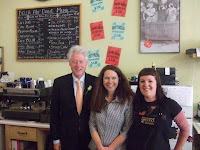 Last year, Bill Clinton stopped in for coffee on Mothers Day. This year, all the VIPS were locals and it was a beautiful day with lots of people enjoying a walk on Main Street in the sunshine. I left work early and drove to Prineville to enjoy a feast (a culinary extravaganza that was a joy to watch!) with my sweetie, his mother Pollianne (just one more classically fabulous name!) and his sisters family. Vanessa's husband Richard racked up some serious points as he prepped and cooked Roasted Artichokes, Grilled Polenta with Parmesan, Ratatouille Stuffed Tomatoes, Crab Cakes with homemade Mango Salsa, Grilled Shrimp kebabs and Strawberry Shortcake (yes, the shortcake was made from scratch!) It was delicious and beautiful! I can't wait to see what Vanessa plans for Fathers Day- but I'm signing up now to help if another feast of this magnitude is in the works! Our Annual Anniversary Yard Sale has an edge this year. We always reward our loyal customers with the craziest deals on super cool things at our Yard Sale but this year is the CRAZIEST YET! The sale begins at 7 am (not one minute before!!) and I'm determined to have the most fun I've ever had at this event - we're talking major league fun and better than a flea market YARD SALE PRICES! Linens, aprons, Mamma Ro ceramics, bubble glass parfaits, Chantal saute' pans and NordicWare stockpots, ceramic bakeware, candle hol ders, flatware, serving platters, doormats, serving pieces and home decor for A DOLLAR! No kidding!!! I'm just thinking that it's time to have a some radical fun and start our teen years with a lot of big smiles and great deals. 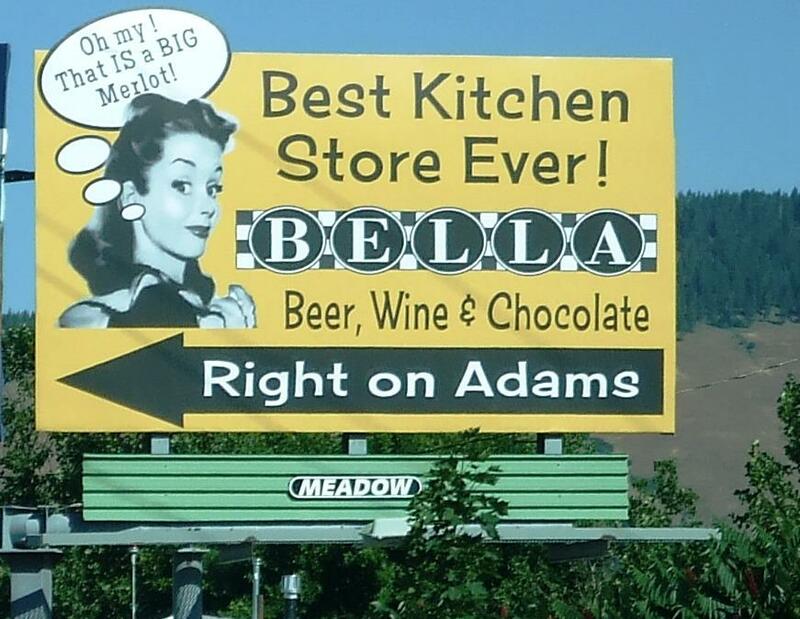 Everyone can use a little retail therapy and the price is right on Saturday at BELLA Main Street Market. 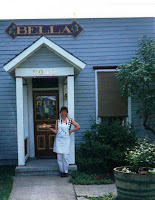 The BELLA baristas will be cranking up the espresso machine and and making FREE Cafe Latte's from 7 am 'til 9am. Plan to join us early in the day to score some serious deals at the YARD SALE and then relax and help us celebrate with the best coffee in town! And for the wonderful Mother's Day gifts you sent. Best of all though, was your phone call that morning. I love you too Beverly!